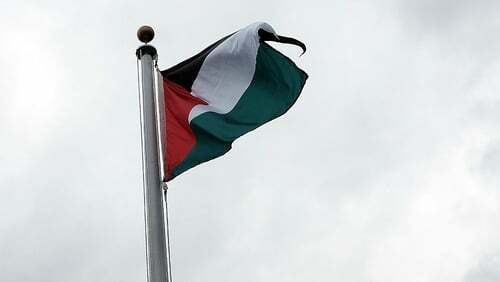 Dublin City councillors have voted to fly the Palestinian flag over City Hall as a gesture of solidarity. The motion proposed by People Before Profit Cllr John Lyons calls for the flag to be flown for the month of May. The motion was carried with the support of Sinn Féin and left-wing parties by 42 to 11, with seven abstentions. Fine Gael and Fianna Fáil members voted against. An amendment from Fine Gael councillors proposing that both the Palestinian and Israeli flags be flown for a week was defeated. The monthly meeting was adjourned to consider a complaint from a member of the public about a potential conflict of interest on the part of three councillors who voted to refer the issue from the Protocol Committee. Patrick Fitzgerald said Cllr Lyons, Sinn Féin’s Mícheál Mac Donncha, and Patrick Costello of the Greens were involved with Palestinian support groups that were also private companies and that there was a conflict of interest. The meeting of the Protocol Committee heard Cllr Lyons is a supporter of the Irish Palestinian Solidarity Campaign while Cllr Mac Donncha is a member. The Protocol Committee voted that there was no conflict of interest and the issue went back to the main meeting for the vote.